New releases, reviews or just rumors...get all the best ATV and Side-by-Side news, alerts and listings in one convenient place. Kawasaki wants to give you an opportunity to take the new Teryx side-by-side for a spin, starting this week at the UTV Rally in Moab, Utah. They will be on hand with a demo ride hospitality area and free technical seminars located inside the Old Spanish Trail Arena. For additional information on upcoming events planned by Kawasaki’s Consumer Events group, please visit http://www.kawasaki.com/NewsEvents/. About 1,400 model year 2008 Honda TRX500 ATVs have been recalled by Honda. 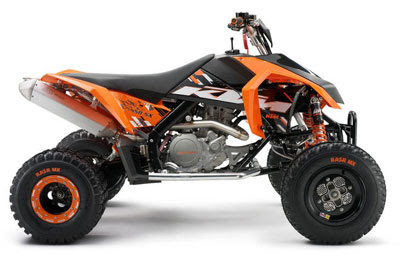 The electric power steering shaft of the recalled ATVs could break unexpectedly, although no incidents or injuries have been reported. See the U.S. Consumer Product Safety Commission (CPSC) page for more info. KTM reveals motocross ATV in Spain! According to KTM, they have created the perfect motocross quad with remarkably low weight in combination with wider front and rear dimensions. KTM also heavily focused on keeping the center of gravity as low as possible by introducing a newly designed fuel tank. Unlike the XC, the SX moels will not have a reverse gear in an effort to save even more weight. They also feature a big airbox with easy filter access and a race-proven Keihin 41 mm. KTM again went the extra mile by topping it off with Maxxis Razr MX tires, rear Douglas beadlock rims and nerf bars as well as a protective cover for the headlight. The SX also has the same industry leading Magura front brakes, Chromoly frame, hydraulic clutch, Magura handle bar as the acclaimed XC models. The specifically developed WP suspension elements are another highlight and feature a wide range of adjustments, most of which are unique to the industry: High & Low speed compression adjustability both in the front and rear, Crossover design both in the front and rear. Just one of the many specs listed on the newly added page to GG Quad North America's website. Check it out. An update from Melissa Brandao over at Barefoot on the Mythbusters show I mentioned awhile back. The video is now up on the Discovery Channel website and features a head-to-head comparison of the Model One and a Polaris 800 gas-powered ATV. And don't laugh, it actually looked similar to the now defunct WPSA Quad Terrain Challenge races. Draw your own conclusions from the faster lap times on the electric quad, the point is that battery-powered machines are not at a disadvantage in power department. 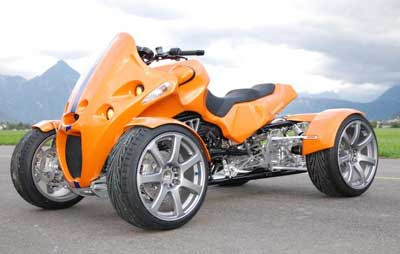 But actually, the line that struck me was that the Model One is around 100 pounds lighter than comparable gas ATV. That is huge not only in performance, but safety. Safety is going to be the battleground for ATVs in the coming years if it isn't already. 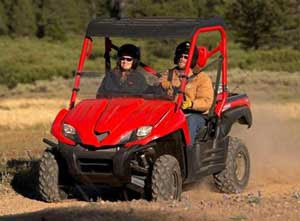 Privately held Bombardier Recreational Products Inc. has separated its operations to encompass two different businesses, one representing Can-Am ATVs and Can-Am roadsters and one representing a new Ski-Doo/Sea-Doo division. Yves Leduc becomes VP and general manager of the new Can-Am division while Alain Villemure becomes VP and general manager of the new Ski-Doo/Sea-Doo division, which includes Ski-Doo snowmobiles, Sea-Doo watercraft and Sea-Doo sport boats. BRP says the split of Can-Am, Ski-Doo and Sea-Doo was implemented to help provide better flexibility, increased specialization and to improve processes for rigorous execution. 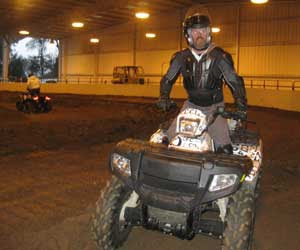 And if you have been to any of the quad racing series lately, you know Can-Am is serious about this ATV thing!